Grumpy: Hah! Women! A fine kettle of fish. Snow White: [to the Seven Dwarfs] Please don't send me away. If you do, she'll kill me. Dwarfs: Kill you? Happy: Who will? Sneezy: Yes, who? Snow White: My stepmother, the queen. Dwarfs: The QUEEN! Bashful: She's wicked! Happy: She's bad! Sneezy: She's mighty mean! Grumpy: She's an old witch! And I'm warnin' ya, if that queen finds her here, she'll swoop down and wreak her vengeance on us! Snow White: But she doesn't know where I am. Grumpy: She don't, eh? She knows everything. She's full of black magic! She can even make herself invisible. Pfft! Might be in this room right now! Snow White: [to the Dwarfs] That was fun. Prince: One song, my heart keeps singing, of one love, only for you. Snow White: Supper's not quite ready. You'll just have time to wash. Dwarfs: [in unison] Wash? Grumpy: [scoffs] I knew there's a catch to it! Snow White: [seeing the Dwarfs' cottage for the first time] Oh, it's adorable! Just like a doll's house. Evil Queen: This is no ordinary apple. It's a magic wishing apple. Sneezy: [raising his hand and pointing to the sink] Hey, someone stole our dishes! Happy: They ain't stole. They're hid in the cupboard. Bashful: My cup's been washed. Sugar's gone. Happy: Something's cooking. Smells good. Grumpy: [shoving Happy and Dopey away] Don't touch that, you fools! Might be poison. [the kettle spews steam at the three of them and the lid rattles] Grumpy: See? It's witch's brew. Queen: Dip the apple in the brew. Let the Sleeping Death seep through. [the poison on the apple forms a skull] Queen: Look! On the skin! The symbol of what lies within. Now, turn red, to tempt Snow White, to make her hunger for a bite. Queen: [offering the apple to the raven] Have a bite? [the raven flaps wildly, trying to escape] Queen: [laughing] It's not for you, it's for Snow White. When she breaks the tender peel, to taste the apple in my hand, her breath will still, her blood congeal, then I'll be fairest in the land! Snow White: [to the pidgeons] Want to know a secret? Promise not to tell? [singing] Snow White: We are standing by a wishing well / Make a wish into the well / That's all you have to do / And if you hear it echoing / Your wish will soon come true. Grumpy: [watching the Dwarfs washing themselves] Next thing you know, she'll be tyin' your beards up in pink ribbons and smellin' ya up with that stuff called, uh... "perfoom". Snow White: [to the Seven Dwarfs] If you let me stay, I'll keep house for you. I'll wash and sew and sweep and cook... Dwarfs: COOK? Doc: Uh, can you make dapple lumplings? Er, lumple dapplings? Grumpy, Sleepy: Apple dumplings. Doc: Yes, crapple dumpkins. Snow White: Yes, and plum pudding and gooseberry pie... Dwarfs: Gooseberry pie? Hooray! She stays! Bashful: [about Snow White] She's beautiful. Just like a... angel! Doc: [as Dopey hesitantly sneaks up to their room where Snow White is sleeping] Don't be afraid. We're right behind you. Dwarfs: [chorusing] Yes, we're right behind you. Snow White: I'm wishing. Snow White's Echo: I'm wishing. Magic Mirror: Prepare to be amazed beyond all expectations. After all it is what I do. Snow White: Once there was a Princess. Doc: Was this princess you? Snow White: And she fell in love. Sneezy: Was it hard to do? Snow White: It was very easy/anyone could see/that the Prince was charming/the only one for me. Doc: Was he strong and handsome? Sneezy: Was he big and tall? Snow White: Their's nobody like him/anywhere at all. Bashful: Did he say he loved ya? Happy: Did he steal a kiss? Snow White: [sung] He was so romantic/I could not resist. Sleepy: Maybe the Old Queen has got Snow White. Dwarfs: [all sniff in unison] Ahh... soup! Hooray! Huntsman: [dropping the knife] I can't... I can't do it! Forgive me. I beg of Your Highness, forgive me. Snow White: Why, I don't understand. Huntsman: She's mad! Jealous of you! She'll stop at nothing! Snow White: But... But who? Huntsman: The Queen! Snow White: The Queen? Huntsman: Now, quick, child, run! Run away, hide! In the woods, anywhere! Never come back! Now go! Go! Run! Run! Hide! Queen: Take her far into the forest. Find some secluded glade where she can pick wildflowers. Huntsman: Yes, Your Majesty. Queen: And there, my faithful huntsman, you will kill her! Huntsman: [protesting] But Your Majesty! The little princess!... Queen: [rising] Silence! You know the penalty if you fail. Huntsman: [solemnly] Yes, Your Majesty. Queen: But to make doubly sure you do not fail, bring back her heart in this. Snow White: I'm awfully sorry. I didn't mean to frighten you. But you don't know what I've been through. And all because I was afraid. I'm so ashamed of the fuss I made. Snow White: [seeing a chair] Oh! [the animals scurry away as Snow White sits in the chair] Snow White: What a cute little chair. 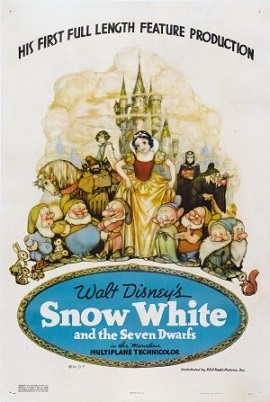 p [the animals peek out from their hiding places] Snow White: Why, there's seven little chairs. Must be seven little children. And from the look of this table, seven un-tidy little children. Snow White: [Waking up] Oh, dear! I wonder if the children are... [Sees the dwarves peeking from the edge of the bed] Snow White: Oh! [the dwarves hide, then peek again] Snow White: Why - Why, you're little men. [the dwarfs look at each other, then reveal their whole faces before Snow White] Snow White: How do you do? [the dwarfs look at each other again, but don't answer] Snow White: I said, how do you do? Grumpy: How do ya do, what? Snow White: Oh, you can talk. I'm so glad. Queen: Magic Mirror, on the wall, who, now, is the fairest one of all? Magic Mirror: Over the seven jewelled hills, beyond the seventh fall, in the cottage of the Seven Dwarfs, dwells Snow White, fairest of them all. Queen: Snow White lies dead in the forest. The huntsman has brought me proof. Behold, her heart. Magic Mirror: Snow white still lives, fairest in the land. 'Tis the heart of a pig you hold in your hand. Queen: The heart of a pig! Then I've been tricked! Queen: Slave in the magic mirror, come from the farthest space, through wind and darkness I summon thee. Speak! Let me see thy face. Magic Mirror: What wouldst thou know, my Queen? Queen: Magic mirror on the wall, who is the fairest one of all? Magic Mirror: Famed is thy beauty, Majesty. But hold, a lovely maid I see. Rags cannot hide her gentle grace. Alas, she is more fair than thee. Queen: Alas for her! Reveal her name. Magic Mirror: Lips red as the rose. Hair black as ebony. Skin white as snow. Queen: Snow White! Grumpy: Ask her who she is, and what she's a-doin' here! Doc: Ah, yes. Now what are you, and who are you doin' here? Snow White: You're Sleepy! Sleepy: [Yawning] How'd you guess? Happy: This is Dopey, he don't talk none. Snow White: You mean he can't talk? Happy: He don't know, he never tried. Doc: Shh! Not so loud. You'll wake her up. Grumpy: Ah, let her wake up! She don't belong here nohow! Doc: Step up to the tub, 'tain't no disgrace / Just pull up your sleeves and get 'em in place / Then scoop up the water and rub it on your face / And go "Bl-bl-bl, bl-bl-bl, bl-bl-bl!" Grumpy: [During "Someday My Prince Will Come"] Ha! Mush. Doc: The, uh, Princess will sleep in our beds upstairs. Snow White: But, where will you sleep? Doc: Oh, we'll be quite comfortable down here, in, uh, in, uh... Grumpy: In a pig's eye! Doc: In a pig's eye - sty - No! No! I mean... We'll be comfortable, won't we, men? Happy: I'd like to dance and tap my feet / But they won't keep in rhythm. / You see, I washed 'em both today / And I can't do nothin' with 'em. Bashful: I chased a polecat up a tree / Way out upon a limb / And when he got the best of me / I got the worst of him. Snow White: Oh, I feel strange. [Starts gasping for air] Queen: [to herself] Her breath will still. Her blood congeal. [Snow White drops onto the floor] Queen: [Cackling] Now I'll be fairest in the land! Queen: And because you've been so good to poor old Granny, I'll share a secret with you. This is no ordinary apple, it's a magic wishing apple. Snow White: A wishing apple? Queen: Yes! One bite, and all your dreams will come true. Snow White: Really? Queen: Yes, girlie. Now, make a wish, and take a bite. Grumpy: A fine bunch of water lilies you turned out to be. I'd like to see anybody make me wash, if I didn't wanna. Queen: Now, a formula to transform my beauty into ugliness. Change my queenly rainment to a peddler's cloak. Mummy dust, to make me old. To shroud my clothes, the black of night. To age my voice, and old hag's cackle. To whiten my hair, a scream of fright. A blast of wind to fan my hate. A thunderbolt to mix it well. Now, begin thy magic spell. Queen: All alone, my pet? Snow White: Why... why, yes, I am, but... Queen: The... the little men are not here? Snow White: No, they're not, but... Queen: Mmm... mm-hmm. [Sniffing] Queen: Baking pies? Snow White: Yes, gooseberry pie. Queen: It's apple pies that make the menfolks' mouths water. [presenting the poisoned apple to Snow White] Queen: Pies made from apples like these. Snow White: Oh, they do look delicious. Queen: Yes, but wait till you taste one, dearie. Like to try one, hm? Go on. Go on, have a bite. Grumpy: Angel, ha! She's a female! And all females is poison! They're full of wicked wiles! Bashful: What are wicked wiles? Grumpy: I don't know, but I'm agin' 'em.